The identities of the Israeli youths suspected of ties to extremist groups remain under gag order; father of one has provided alibi. After days of speculation and rumors of a major breakthrough in a security investigation, some of the facts have finally come to light. The Israel Security Agency (ISA or Shin Bet) revealed on Thursday that Israeli security forces have arrested several Israeli youths over their alleged ties to Jewish extremist organizations which conduct attacks against Arabs. 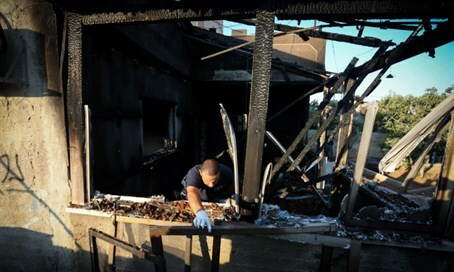 The suspects are being interrogated especially in connection to the deadly arson attack at the Dawabshe family home in Duma last July. The Palestinian Arab family's younger son, 18-month-old Ali Dawabsheh, burnt to death in the attack, while his father Sa'ad and mother Reham later succumbed to their wounds. Ali's 4-year-old brother Ahmed remains hospitalized in serious condition. A police spokesperson relayed that "we have been cleared to publish that the investigation is being conducted in a joint operation between the Israel Security Agency, Israel Police, and the State Attorney's Office." "Other details of the investigation, including the identities of the detainees, remain under a gag order." Attorney Itamar Ben-Gvir, who is representing one of the suspects, is claiming ISA agents and police have infringed on his client's rights. "We are gradually becoming like Argentina," he charged. "They won't let me see [my client], they won't bring him to court hearing, they're hiding him in a basement at Shin Bet headquarters after beating and attacking him during his detention." Meanwhile, according to Yedioth Ahronoth, the father of one of the suspects has provided his son with an alibi, asserting that he and another suspect had been in Tzfat at the time of the attack. "Half of Tzfat saw them there and the Shin Bet knows it too," the father stated, explaining that his son and son's friend had visited him on the Thursday night prior to the attack before traveling to the northern city to visit his ex-wife. Three Israelis were placed under administrative detention for alleged extremist activities in the wake of the Duma arson though none of them have been explicitly tied to the attack.